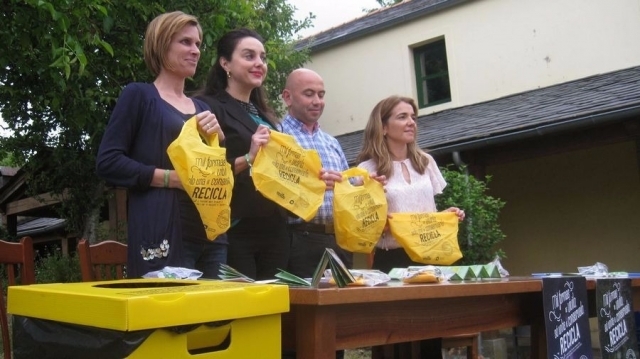 A total of 146 Galician hostels are part of this initiative that tries to turn the Camino de Santiago into "emblem in Europe of recycling"
'Camino del Reciclaje', a campaign to spread respect for the environment and promote environmental quality on the Camino de Santiago, expands by adding up to 18 new shelters of the Northern Way in Galicia. These accommodations join the 130 of the French Way already adhered during 2016 to this initiative, which is part of the Strategic Plan of the Camino de Santiago, thanks to the collaboration of the Xunta de Galicia and the non-profit organization Ecoembes. The announcement of this extension of the campaign to new shelters has taken place in the public shelter of Baamonde, located in the Northern Way, and it has been attended by the general directors of Tourism and Environmental Quality of Galicia, Nava Castro and Cruz Ferreira; The Mayor of Begonte, José Ulla and the Director of Corporate Communication and Marketing of Ecoembes, Nieves Rey. Nava Castro has encouraged pilgrims "to serve as an example" to others, "demonstrating that it is possible to reduce the impact on the forests or rivers with simple gestures thanks to the multiplier effect" of pilgrimages. The 'Camino del Reciclaje' campaign involves both pilgrims and public shelters. In the case of the pilgrims, kits (up to 29,000) are distributed with specific bags to deposit their waste while they walk and can then deliver to the shelters on arrival to avoid harming the Camino de Santiago. In the public shelters, in turn, blue and yellow containers have been installed to separate paper and plastic containers.